Just in case you’ve missed it, as this has been posted on several Second Life blogs, the BBC has aired a documentary on virtual adultery and cyberspace love, called Wonderland: Virtual Adultery and Cyberspace Love, and it covers both love and adultery with real life examples, one couple who met because of Second Life and another that is coming apart because they are not happy together and Second Life has helped her find something she says she needed. If you are in Britain, you can watch the whole video here, for everyone else, I have posted the first 10 minute video below, part two is here, part three is here and part four is here. With all the talk the past couple days about the ESC, Electric Sheep Company, letting over 20 employees go, it got me to thinking about the CSI:NY episode Down the Rabbit Hole, which got me interested again in seeing what the CSI sim is like today. This did not last too long, unfortunately. I went there expecting to see another Murder by Zucker mystery, but the first one was still there, so no use going through all of that. I don’t remember what the last Mystery game was, so, I decided to check that out and selected number three on the teleport map. Once there though, I quickly found out that the crime stuff wasn’t going to work for me, where other avatars received information, all of the scripted objects just stared back at me. Nothing worked, I couldn’t even guess the killer or how the paint got on the body’s arm. So, here are the rest of the pics I took as I tried everything out, and a little more commentary at the end. So, apparently this has already aired over seas, and I will be looking forward to seeing it, and will catch, at a minimum, the Second Life, or virtual world portion of it. Silver and Goldie Goodman produced the following video, Second Life: Get One, winner of the Second Life Trailer Contest. Looks like ABC is joining the ever growing group of TV shows that are appearing in or featuring a virtual world like Second Life. According to Australia’s Second Life News Source, SLOz, the Australian made comedy, the Librarians makes it’s debut this week and there is a tie-in event scheduled on the Melbourne Laneways section of ABC Island. While Second Life doesn’t appear on the program, I don’t think, they are drawing people in for an event on their Island, so it will probably be worth checking out to see if it is funny and to see what kind of stuff they are going to do inworld. If your cable company does not offer it, you can watch it online here after 10pm, I assume that is AEDT time zone. The following night they will hold a discussion about the episode. When: Thursday November 1st at 7:30pm AEDT, 5:30pm (WA) 1:30am SL time (PDT). The Librarians, is a new six-part comedy series from ABC TV, based around the highly-strung head librarian of an outer suburban Melbourne library. This new social satire premieres on Wednesday October 31 at 9.30pm AEDT. Or if you can’t watch it live, you can view it online at http://abc.net.au/tv/librarians/from 10:00pm. Fans of Second Life may soon become fans of the Office, if they aren’t already, as articles from Tech Blorge and Second Life Insider mention more upcoming episodes with Second Life in them. This would make perfect sense as the some of the last of the Local Ad episode featured Jim’s avatar that he created and Pam giving him a hard time about buffing it up and making sure it looked like him. This would be a perfect way to mess with Dwight, like he does on most episodes, and it’s hard to imagine what kind of stuff they will come up with in the future. They also have a little more info about the Local Ad episode that was on last week. The episode was written by 28-year-old B.J. Novak (who also plays the show’s recently-promoted intern Ryan.) He written a line about an unhappy Dwight loving Second Life so much, he’d “created his own world. It’s called Second Second Life. But he also included at least one line that suggested a real affection for the game, showing at least one way that a virtual life could fascinate an eccentric like Dwight. “Absolutely everything was the same. “Except I could fly.” Source: More Second Life pranks coming to The Office? I myself will be watching for it as I usually try to catch the Office anyway. For the person who wants to be even more removed from society, Second Second Life, or at least that’s how Jim referred to it. I believe that’s how he said it; anyway, it was pretty funny, about what I expected from Dwight, who said, he signed up a year ago to Second Life because his first life was going so well that he wanted a second one. Watch full episode of the Office here, looks like they put up every odd numbered episode, they have posted the new one, it is called Local Ad and you cn watch it right now online. Pretty cool NBC, now I can watch the end of it, as I think I feel asleep. Here is a great video from Anthony Zuiker of CSI:NY fame and in this video he gives out some great information on tonight’s episode, Down the Rabbit Hole featuring Second Life. The first thing he mentions, and I saw it somewhere the other day, that CBS had acquired the Electric Sheep Company, which is a great move on their part, buy the Second Life creative team ESC and start building stuff to include it in some of your series that would lend itself to something like Second Life, such as CSI, and create some stickiness for your TV series. He also describes the thought process behind the Down the Rabbit Hole episode, such as having the sim after the show that people can do stuff in and interact with, they are calling it the CSI:NY Virtual sim, where they have recreated the Flat Iron Building, not sure if that is right but it is the one you see in the Spiderman movies and episodes of Friends, they have recreated Times Square, the Chrysler building, the Empire State building, he says they have recreated every inch of New York city, so it really is a virtual representation. It will take you through an orientation process and then right after the show you will be able to do some cool things like a facial reconstruction game, puzzles and memory games, for the intermediate player you will be able to play Murder by Zuiker, a blog written by him in which you have to find one crime scene a month and the one who comes closest to giving the correct explanation of what happened wins a prize. The last thing is Murder of the Month, where you can fly around virtual New York city, find crimes, solve the crimes, go to the virtual lab, be hands on inside the lab, and go to the Cisco teleconferencing system and deconstruct and solve the crimes every month. The same lab that you see in the show, will be the same in the virtual lab, with an audio/visual department, where you can trace, do fingerprints, do an autopsy, think about that, do an actual autopsy on a body to gather evidence, so you can be the CSI in first life and in Second Life, he says. This looks so cool and will definitely be something I check out monthly to see what the crime is and whether people are actually playing and using the sim. Don’t forget, the show is on tonight October 24th at 10pm eastern time, 7pm SLT. Check out the new video below of the creator talking about the new Virtual New York city. Here is a preview of the upcoming CSI:NY episode Down the Rabbit Hole which features Detective Mac Taylor going inworld to catch a killer. This is pretty cool looking, showing them fighting as gladiators in an arena, it definitely does not look like it is going to be one of “those” episodes, looks pretty good so far. Here is the video we posted previously, which are actually some examples of the inworld part of the CSI episode. I don’t believe I had seen the name of the CSI: NY episode that will feature the star going inworld in Second Life to try to track down a killer, the episode name is Down the Rabbit Hole. I also did not know that game one of the World Series is going to air that night as well, wonder how that will affect viewers? Think many baseball fans and Second Life Users cross over? I’m sure they do and I bet most will Tivo or record it on their DVR. Notice I didn’t say which they would record. I also wanted to comment on Prokofy’s posts and comment about the Electric Sheep Company and how they are handing search in the OnRez browser. The Prok seems to think they have hidden it where it is hard to find and that they are getting an unfair advantage, she says things like classifieds will be hard to find, if you can find them at all, that the search will only search the OnRez site and whatever they have scrapped from Second Life. Now, I admire how she stands up for the community, how she tries to protect her own interests, but I’m not going to get worked up over it until I see the browser for myself. No use on going on someone else’s word just to find out they were wrong or mistaken. Take a chill pill Prok and wait until you get a copy of the OnRez browser for yourself to try. Giff Constable has posted on the ESC blog about some of the issues the Prok has raised, and goes on to mention that the SL search will be the only search in the OnRez browser initially, but they are working on their own search saying that Second Life’s search is flawed, which it is, and that they are trying to improve it. As long as the improvements don’t just mean adding the stuff they have for sale or their own sims, I look forward to trying it out for myself. On the TV.com site they have a CSI:NY section, with many forum members and posts, if you are a CSI: NY fan you should check it out, they have a pole in which only 31 readers have voted about whether they are going to tune in or not, you have to register or there would be more votes I’m sure, but 30 out of 31 have voted “Tune in! Hopefully it will live up to all the hype.” I know that doesn’t mean much, but it doesn’t sound like any of the CSI: NY regulars are disappointed about the episode, yet. There is also a five or six page discussion of the show on the Second Life forums, SL CSI Promo…will the grid survive Oct 24th?, most don’t seem concerned about the search yet, as they are taking the wait and see approach. I figured the Prok would’ve posted about it, but she’s probably banned from there or something, guessing. Description: GridTalk-ESC Talks About CSI: New York in Second Life and New SL Viewer - Join us for an hour long interview and discussion with the Electric Sheep Company, talking about bringing the hit TV show CSI: New York in-world, and about their new, free Second Life viewer, based on the open-source viewer code from Linden Lab. The Sheep and CSI have an ambitious plan to tie TV and Second Life together; the TV detectives will be going into Second Life to solve a murder on the episode airing Oct. 25 and again in February. Meanwhile, TV viewers and current residents will be invited to a CSI: New York themed sim to role-play solving the murder. Our guest of honor will be the Sheep’s Forseti Svarog aka Giff Constable in RL. Don’t miss this informative, fun discussion. There has been lots of talk about the upcoming episode of CSI: NY that involves Gary Senise’s character going inworld into Second Life to track down a killer, the video below was released by CBS and it shows an avatar falling to the ground, all bloodied up and dead looking. This certainly looks a lot better than the recent episode of Law & Order SVU, called Avatar, which featured a virtual world that wasn’t real. Come on, you know it’s funny. Their virtual world was referred to as AY, I heard them call it Alternate Youniverse and Another Youniverse, or at least I think I did, and it was very similar to Second Life, but they did not show very much of it. CSI sounds like it is going to be a very involved episode, where they are trying to pull in people to Second Life by having them help track down the killer. A lot more involved than the Law & Order episode, and a lot easier on users who can become overwhelmed by the initial Second Life experience. The Electric Sheep Company has made their viewer look like a web browser, with a back button, which I can’t wait to try out ;), the familiar looking home button, hidden some of the stuff new users don’t need to use yet, and made it a lot easier to get started on your own. 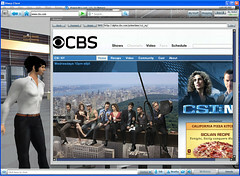 Our goal is to simplify the user experience for a more mainstream audience, and we are launching this new viewer as part of the upcoming CSI:NY project with CBS. We have changed the overall look and menu structures, and moved closer to a Web browser-like model with things like teleport history and a “Back” button. We’ve also made Web browsing much more seamless within the Viewer, and with that comes easier access to OnRez services like Shop and Search (launching with later this month with the CSI project). If many viewers start using Second Life because of this show, then this will certainly put the Electric Sheep Company on the map, to have thousands of users using your client and buying stuff from your website will certainly add a nice, new income stream, and the more your name is heard associated with stuff, the more of an expert you become on the subject. This is one company that has the possibility of a big explosion and growth, and they will continue to add to and update the OnRez viewer, saying “The Electric Sheep Company plans a steady stream of enhancements to the viewer, both in terms of usability and value-added services”. Set your DVR for 10pm Eastern time on October 24th, I normally don’t watch the CSI shows, but I’m sure going to check this one out, and follow along and see how much easier of a start it will be compared to the Linden Labs Second Life Client and Orientation Island. Note: Visit http://viewer.onrez.com/ to get notified when the OnRez Viewers launches. Spoiler: On the CSI: NY TV show, the killer will not be caught until the February 6th episode.